It was less than a month ago when I weighed in on the need for privacy, in the wake of the IRS scandal. In light of the recent revelation of indiscriminate data collection by the NSA – on both foreigners and Americans – I’ll be visiting the topic again. However, for a change of pace, here’s a survey piece pulling in 6 different statistics on transparency and surveillance in America today. 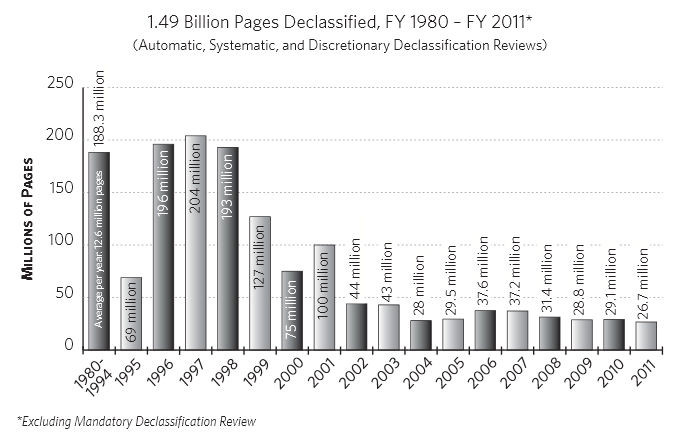 The number of people who are entrusted to make the determination on how a document should be classified – generally, Confidential, Secret, and Top Secret (well, and Unclassified) – has fallen starkly. 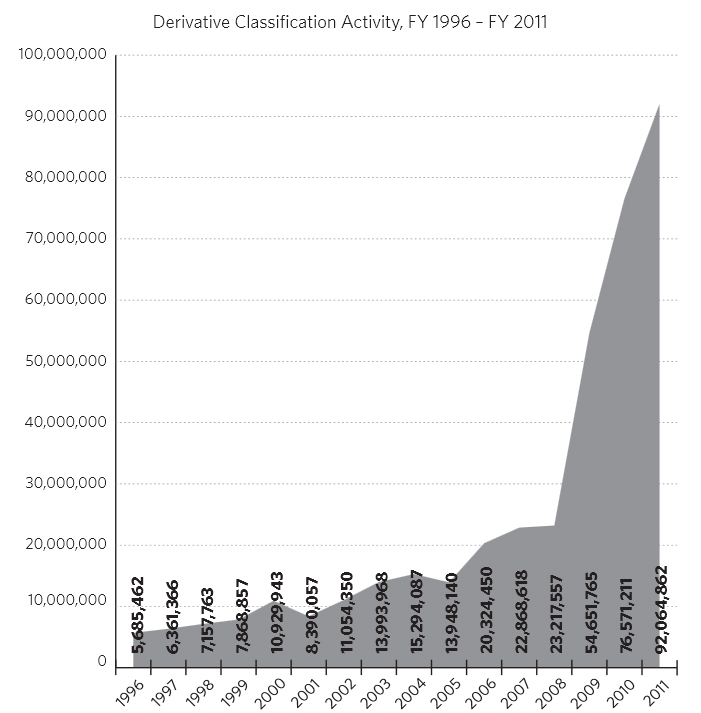 Generally, derivative classified activity occurs when classified information is repackaged in some other form, or is reference in some way. When classified information is referenced, a new classified document is created… at the same level as the highest piece of classified information referenced. The spike can be somewhat blamed on a change in methodology, but the numbers have increased wildly regardless of the method used to count (it’s a survey method in later years). 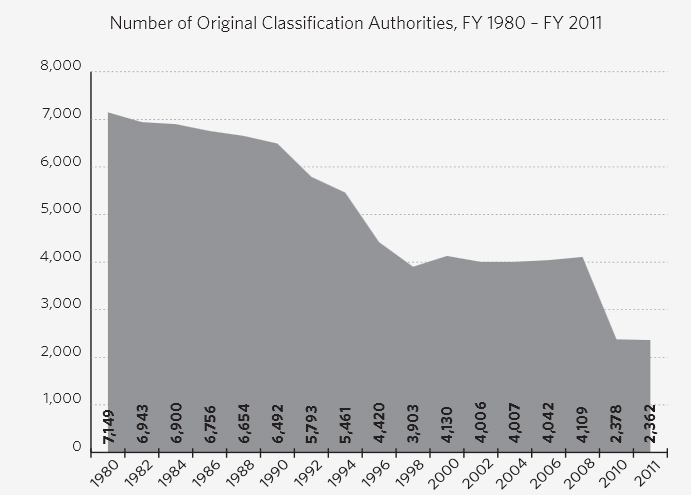 Even with the explosion of new secrets, especially under the current administration, the amount of voluntary declassification has dropped wildly. The Government applies to the Foreign Intelligence Surveillance Court for warrants for physical and/or electronic surveillance. The federal government is the only party to this court – the government presents before a single judge of the court. The hearings are closed to the public, and none of the proceedings are released (occasionally proceedings are released with confidential information redacted). 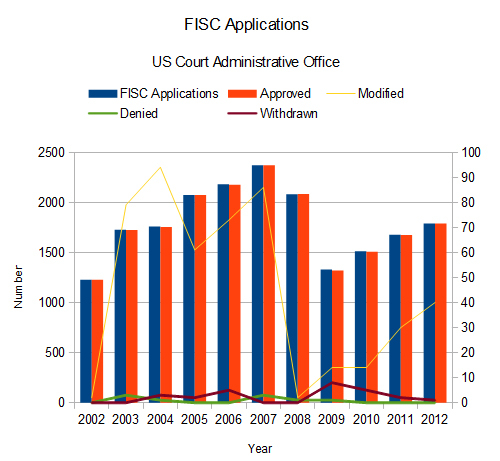 There are currently 11 judges on the court, and 16 have left the FISC since 2002, when these statistics begin. Those 27 judges have issued only 9 denials and 495 modifications total – on 19,726 applications in that time(!). Because the disparity is so large, ‘Modified’, ‘Denied’, and ‘Withdrawn by the Government’ are on the secondary (right) axis. The recently leaked information about the Government indiscriminately collecting phone metadata from millions of Verizon customers was due to a decision by the FISC. As opposed to warrants from the Foreign Intelligence Surveillance Court, National Security Letters are demands letters which seek information from a party related to national security. NSLs come with a gag order, preventing recipients from even going public with information that they received the letter – even if the recipient doesn’t mention any other details. Laws were changed in 2006 and 2008 allowing appeal and attempting to limit their rapid increase in popularity by changing how they could be applied. ‘People’ and ‘Businesses’ are the number targeted by the letters. It’s hard to rectify the claim that this administration would be the most transparent in history with the hard data on the matter. 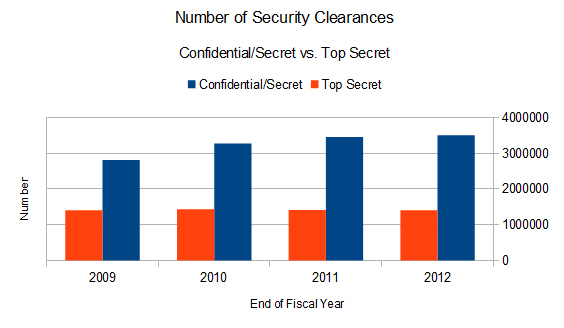 More and more people are generating more and more classified documents, while the Foreign Intelligence Surveillance Court approves 99.84% of surveillance requests. 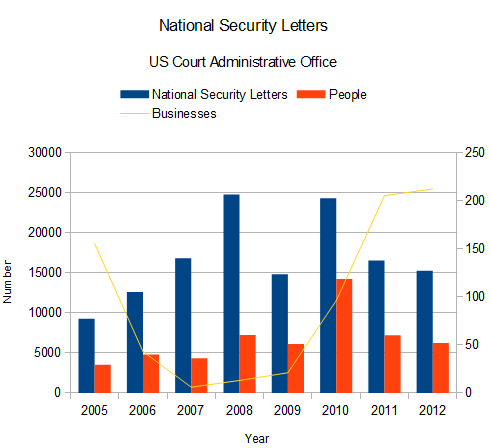 Although National Security Letters have cooled off a bit since their reform in 2008, the last three years of data were also the three years in which the most people were targeted. The major question, of course, is how to roll back the security apparatus in the waning years of a global war on terror. The secondary question? Why are we now watching an increasingly secretive government in an age when private life is anything but. Governments must have secrets, yes, but the government must keep secrets for reasons of safety… not because making information public would be embarrassing. Every bureaucracy strives to increase the superiority of its position by keeping its knowledge and intentions secret. Bureaucratic administration always seeks to evade the light of the public as best it can, because in so doing it shields its knowledge and conduct from criticism. No comments on this one – but feel free to share it publicly and widely!